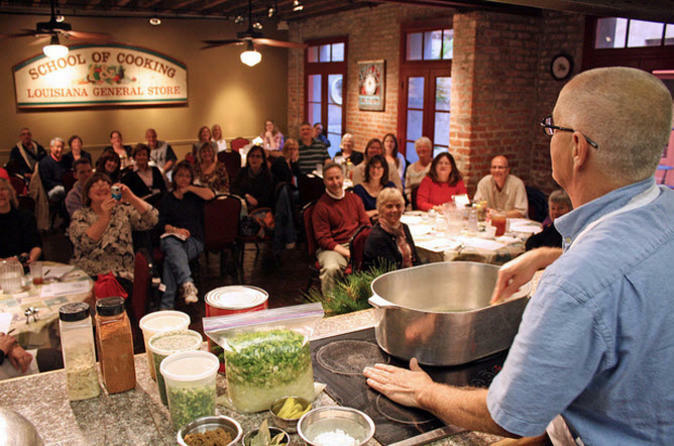 Take an entertaining and informative cooking class at the New Orleans School of Cooking! Located in a renovated molasses warehouse built in the early 1800s, this cooking class brings you to the heart of New Orleans’ French Quarter. Learn the basics of Louisiana cooking from professional chefs and learn how to make classic New Orleans specialties such as gumbo, jambalaya and pralines. Enjoy samplings of these delectable dishes accompanied by complimentary beer, iced tea and coffee, and take the recipes home with you! Food is considered one of the defining elements of Louisiana’s culture, and there's no better way to experience New Orleans than to taste it! During your New Orleans cooking demonstration class, embark on a sensory journey in the kitchen to discover Louisiana's rich tapestry of culinary influences -- French, Spanish, Native American, African and Indian -- as they blend into modern- day Cajun and Creole cuisine. Menu items may include any of the following: gumbo, jambalaya, corn and crab bisque, shrimp or chicken creole, shrimp and artichoke soup, crawfish etoufee, bread pudding, bananas foster, pralines, and pecan pie.